Once you start driving around Mongolia, you pretty quickly get a feel for just how pastoral life is here. Outside the capital, there are some small towns here and there, but the nomadic way of life continues on. By the time I got back from my trip, I felt like pretty much the entire country was one giant pasture for the animals to graze on. 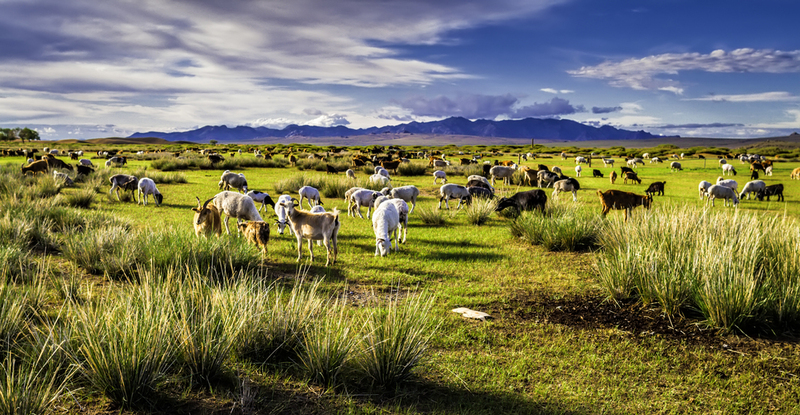 Animal husbandry has long been the primary economic driver in Mongolia. Today it represents roughly 20% of Mongolia's GDP, employing 2/5ths of the country's population. The vast majority of the agricultural output (87%) comes from livestock production. There's a sort of irony or running joke that the number of livestock has reached over 40 million, yet there's less than 3 million people that live in Mongolia, making it one of the least densely populated countries in the world (for humans, at least). I wonder if we'll ever see a Mongolian movie version of the Planet of the Apes but instead use super intelligent goats? Goats graze on the land.